Eye fo Horus Eyeshadow Palette – Isis Sun God. A fusion of precious metals, in shimmering metallic shades, designed especially for the Sun Goddess. An eyeshadow shadow palette that is Italian baked in satin and metallic shades. Deeply pigmented, long-wearing crease-proof formula to deliver everyday brilliance. 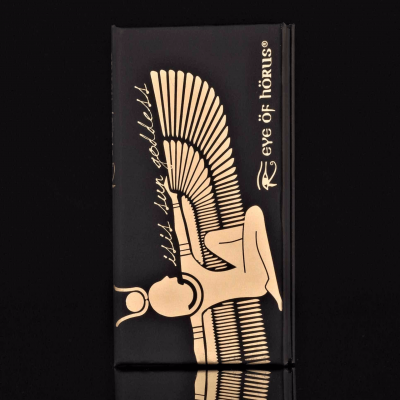 Eye of Horus Eyeshadow Palette – Isis Sun God. A fusion of precious metals, in shimmering metallic shades, designed especially for the Sun Goddess. 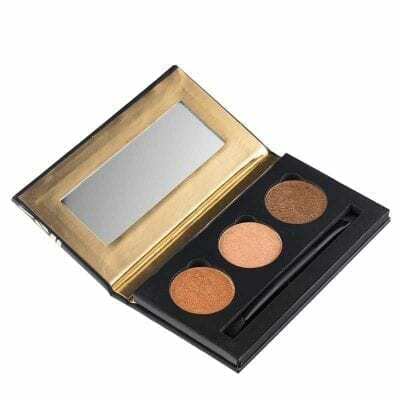 An eyeshadow shadow palette that is Italian baked in satin and metallic shades. Use the Eye of Horus eyeshadow palette, baked Goddess shadow range either dry, for a subtle day ware effect or wet for a full-intensity finish. When water-activated, shadow colours transform to be more intense and radiant if desired. These remarkable properties give the freedom to create any kind of look from simple to dramatic in seconds. Paraben-Free and Vegan formula. Enigma Mist – Soft Pink Metallic Satin (light), Chalice Bronze – Golden Bronze Metallic Satin (medium), Sacred Husk- Rich Golden Brown Metallic Satin (dark). View the full Eye of Horus range here. They started off as an illuminating essential range of eye makeup, and have now expanded to lip products and tools. Based on formulas of the ancient Egyptians, the originators of beauty and mystique, with sacred ingredients including Organic Moringa Oil “Oil of the Pharaohs”, claimed by the Gods for its beautifying and regenerating powers. The iconic Eye of Horus range takes its inspiration from the ancient Egyptians who wore eye makeup because they believed that it offered magical powers and protection to the wearer. They lined their eyes with black Kohl, creating an almond-shaped eye – The Eye of Horus – which was believed to protect their eyes as well as providing a statement of beauty. The cosmetic range focuses on ancient ingredients to deliver the best quality and highest performing products possible to make every woman feel like a true Goddess.